Now I admit to geeking out on the science of cooking now and then—I’ve got a soft spot for Alton Brown‘s brand of nerdiness—but invert sugar sounds like molecular gastronomy to me. I just like making things from scratch. Nonetheless I was intrigued. Could this one thing really truly improve the texture of my sorbet that much? I had to find out. Apparently invert sugar really isn’t that high up on the technical scale. It’s made by taking traditional sugar and using an acid—lemon juice, cream of tartar, citric acid—and heat to break the sucrose into equal parts fructose and glucose dissolved in water. The resulting syrup crystallizes more slowly than regular sugar, giving the product it is added to a softer, creamier texture. While you can buy invert sugar (try Surfas or Gloria’s Cake & Candy Supply in Los Angeles), I decided I wanted to make it myself. (Did I mention I like to make things from scratch?) I had trouble finding a recipe, though, so I decided to experiment. I combined one cup of water, one cup of sugar and ¼ teaspoon of citric acid and simmered it for about 30 minutes and then let it cool. With my experimental invert sugar on hand, I rinsed off the tart, sweet raspberries I picked with my family at Underwood Family Farms in Simi Valley and ran them through the food processor and then through a fine sieve to get out all the seeds. Some water, the invert sugar and chill time later I found myself scooping out the creamiest, most luscious-textured sorbet I’d made to date, like velvet across the tongue. Even after a few days in the freezer the sorbet, which usually hardens into a block of ice, stayed soft and scoopable. Next up, sugar plum sorbet…inverted of course. *invert sugar – 1 cup water, 1 cup sugar, ¼ teaspoon citric acid or cream of tartar, simmered for 30 minutes and then cooled. Puree the raspberries in a blender or food processor. Push through a sieve with the back of a spoon to remove the seeds. Add one cup of water and the invert sugar to the raspberry puree. Stir and refrigerated until thoroughly chilled (about 8 hours). Freeze according to your ice cream maker’s instructions. That’s great! I’m always so frustrated by sorbet which freezes rock hard. I even asked one of the chefs I work with and he had a couple of suggestions, none of them invert sugar. It’s true. That sorbet was so creamy you would swear there was dairy in it. Or something magical. What a brilliant thing! Thank you so much for figuring this out and sharing. I can’t wait to give it a try. How very very interesting! 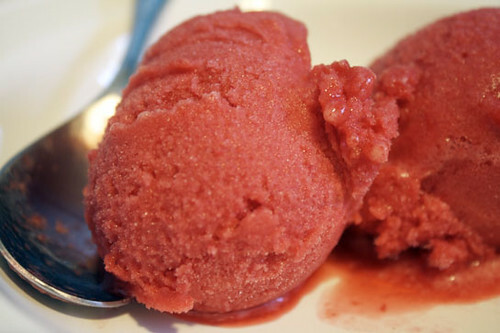 i love sorbet that’s creamy. this sounds so delicious. I haven’t tried Mozza yet but have been dying to! wow this sounds really interesting! i’ve never heard of inverted sugar before. my ice creams always come out a bit hard so i will have to try using the inverted sugar for it next time. Invert sugar is perhaps the most wonderful discovery I’ve made this year. It’s really just simple syrup with acid. You can cook for as little as 5-7 minutes for a partial invert. I make homemade marshmallows, but I never liked using corn syrup. Invert sugar is the perfect replacement – it’s a much cleaner flavor, which doesn’t compete with the extracts or flavorings I use in my candies. Now that fall’s here, I think I have to try it for salt caramel recipes. This post is making me drool again!! BTW, I gave you an “Honest Scrap” blog award. This thing is a little like a chain letter, but because it comes out of love, I think it’s kind of nice. 🙂 Check my blog for details http://postmarkhere.wordpress.com. We had a great time at your party a few weeks ago. Hope to see you again soon! wow, yum. The colour of that sorbet is incredible. Melbourne’s winter is coming…But still I wanna try this one…rasberry thats color is so beautiful. We just eat it all in one sitting. No leftovers. You’re welcome.